Expo 2020 Dubai Bureau announced today that it has signed an agreement aimed at protecting its intellectual property. The aim of the memorandum of understanding (MoU) with Emirates Intellectual Property Association (EIPA) is to raise awareness about the importance of protecting intellectual property as part of EIPA’s drive to make the country one of the best in the world by 2021 in this area. 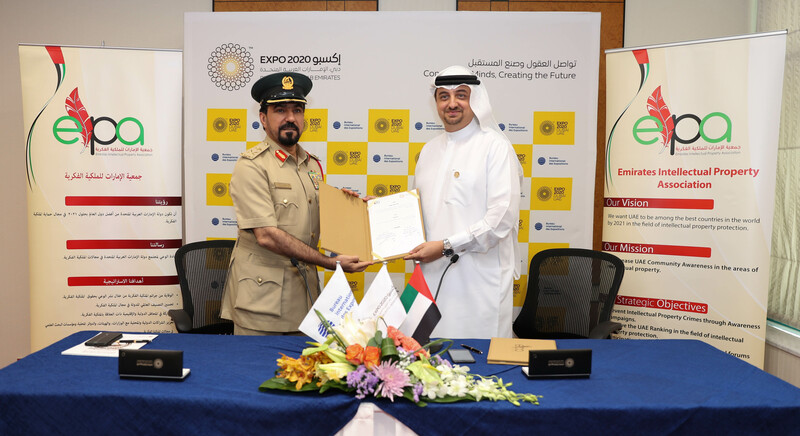 The MoU was signed by Najeeb Mohammed Al-Ali, Executive Director, Dubai Expo 2020 Bureau, and His Excellency Dr Abdul Qaddous Abdul Razzaq Al Obaidli, Assistant Commander for Quality and Excellence in Dubai Police and Chairman of the Emirates Intellectual Property Association. Through the MoU, both parties will cooperate on joint initiatives and projects to develop a joint strategy for protecting Expo 2020 Dubai intellectual property. Najeeb Al-Ali said: “We value the efforts of the EIPA in raising awareness and protecting intellectual property. We are confident that the association will play an important role in protecting the Expo 2020 Dubai trademark locally and internationally. He added: “The UAE ranks among the top countries in the world in terms of taking important steps to protect intellectual property and trademarks and updating their laws and legislations in this regard. The MoU provides for EIPA to help protect the Expo 2020 Dubai logo and its trademark locally and internationally, in addition to raising awareness on all levels and developing a comprehensive culture for protecting intellectual property rights related to the event. HE Dr Abdul Qaddous Abdul Razzaq Al Obaidli said: “The UAE pays great attention to the protection of intellectual property, in line with the belief of the country’s leaders in innovation as a key contributor a thriving society with a knowledge-based, competitive and sustainable economy that guarantees a safe future for current and future generations. “Expo 2020 Dubai represents the embodiment of the national approach since it is based on celebrating human innovations. The MoU also sets out the exchanging of studies and practices adopted by Expo 2020 Dubai in the field of intellectual property protection, as well as other relevant studies and practices, especially since the event is being hosted for the first time in the region on the Middle East, Africa and South Asia (MEASA) region. Expo 2020 Dubai opens its gates on October 20, 2020 and will close six months later on 10 April, 2021.